With the incomparable Vince Dooley at the recent Dahlonega Literary Festival. Dooley, of course, is the retired 25-year, über-successful head football coach at the University of Georgia, and later Athletic Director. Coach Dooley is 85 years old and had flown in from Honduras the night before. He presented on his new book, The Legions Fighting Bulldog, about a Civil War hero from Athens. He paced the head of the room and spoke for over an hour with no notes, seamlessly weaving stories and tales about the events in the book. Of course, Herschel Walker and the UGA 1980 National Championship worked their way into his talk, but who could blame him! We chatted before his talk and I told him I was a 1978 Ole Miss graduate. “John Fourcade was your quarterback then, wasn’t he?” he asked. Yes, Fourcade was our quarterback and Coach proceeded to tell me stories about the recruiting battle of Fourcade. Folk, I’m happy to report that Coach Dooley still has it. Long live the Coach. Enjoyed moderating a “Humor in Writing” panel at the recent Dahlonega Literary Festival. Was honored to be with each of the two panelists, Jacob Appel and Man Martin, for a lively audience discussion. Jacob Appel is a man of boundless energy and intellect. He earned a bachelor’s degree but didn’t stop there. He now owns seven masters degrees, an M.D. from Columbia University, and a J.D. from Harvard Law. He is an author, bioethicist, physician, lawyer, and social critic. He has published 15 books and ten plays, and his short stories have been published in over 200 literary journals. The writing awards are too numerous to list. His latest novel, Millard Salter’s Last Day (2017) was published by Gallery Books, a division of Simon & Schuster. Oh yeah, in his spare time, Jacob is on the faculty of Mt. Sanai School of Medicine and is a licensed NYC sightseeing guide. His genre is literary fiction, and he skillfully uses humor in his writings, sometimes dark humor. I don’t know when Jacob or Man find time to sleep! This photo taken by wife Maureen chronicles our celebration during the Great Solar Eclipse of 2017 on August 21. Our two daughters arrived with friends for an Eclipse Party at our house in Dahlonega where we were on “the cusp of totality” with 90% blockage. The guys smoked cigars and we all enjoyed Eclipse adult beverages. From high on our balcony at the Eclipse’s apex, I played Ode to the Eclipse on my African djembe drum. We sacrificed part of a cow in the form of Maureen’s spaghetti dinner. Autumn is always a busy time and this year is no different. I’m happy to report that I was selected as a presenter at Brenau University’s (Gainesville, Georgia) first annual Brenau LitFest on Saturday, October 14. I will conduct a workshop entitled “Humor Me This,” a title that gives me license to be funny while imparting some tips on creating more humor in your life. I really enjoy these fall festivals. It borders on work to set up and be there for two long days in a row. I usually sell boatload copies of Luck Be A Chicken, but the fun is in the interaction with the people, making them laugh while describing the antics of Butterbean and Ruby Sweat. You’d be surprised at how many people come back at me with their own similar, humorous, real-life stories. I write them down to add to my cache. Oh, yes, I will steal your story! Finally, I’m excited about starting the process of seeking a publisher for my next book, a collection of stories and essays delivering humor and satire with chops and attitude. It will not be for the faint-hearted. Napoleon Bonaparte said, “From the sublime to the ridiculous is but a step,” and this new book will gleefully take a flying leap on a wide variety of topics. To that end, I will be attending the Fall 2017 Atlanta Writers Conference sponsored by the Atlanta Writers Club, November 3-4. This will be their 17th annual Writers Conference. I will be presenting in advance a nonfiction book proposal to a New York literary agent and to a New York editor for critique. Stay tuned. Writing a book is but half the journey; publishing and marketing the other. One day in the coming months, I hope to announce publication plans for this next book. 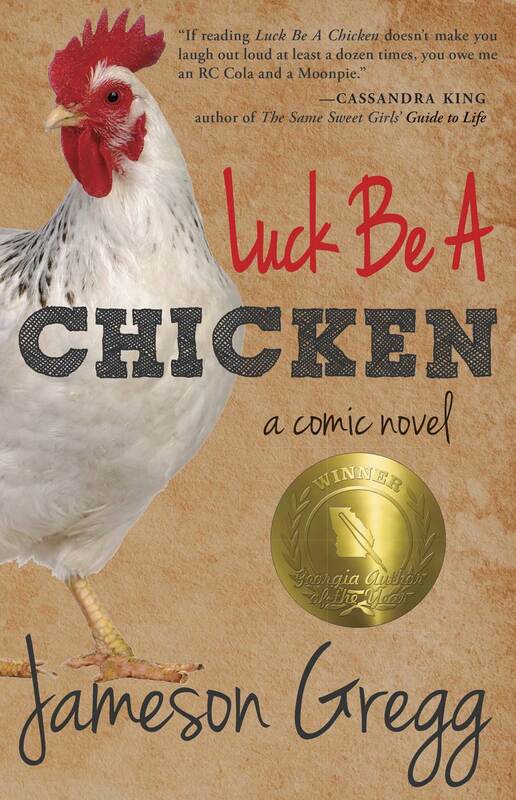 LUCK BE A CHICKEN is now available. Click the image, below, to order the book.